Designed for you and your team to simply pick up and go. Run your day-to-day operations from anywhere and watch the job get done faster when your team’s organized and your process is streamlined. Your team knows their assignments for the day, and you know their whereabouts as they move from job to job. Download the Jobber app for iOS or Android and add your team members as authorized users on your Jobber account. The Jobber app gives you the information you need up front, so you can make fast and accurate scheduling decisions in the field. 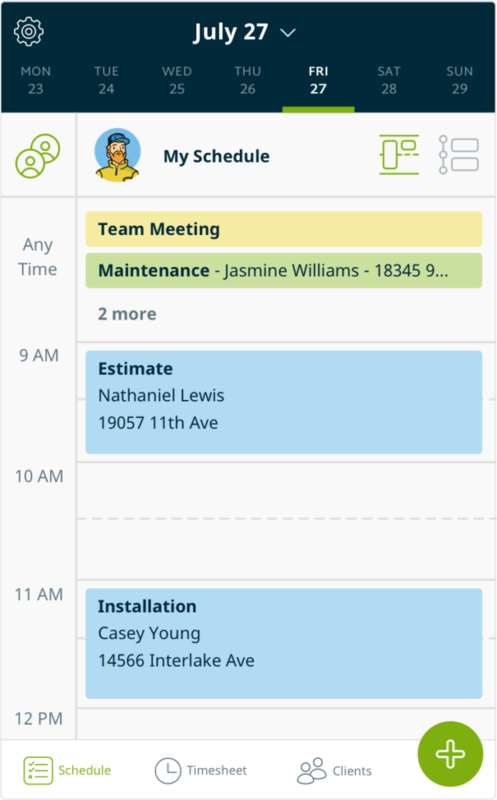 The Jobber app is also your team’s source for their most up-to-date schedule. If you make a schedule change to their current workday, the Jobber app alerts them with a push notification. Client and property information are paired up with service items and notes so that your team has a clear picture of what needs to be done. Custom forms and checklists and the ability to attach photos to jobs help with quality assurance. 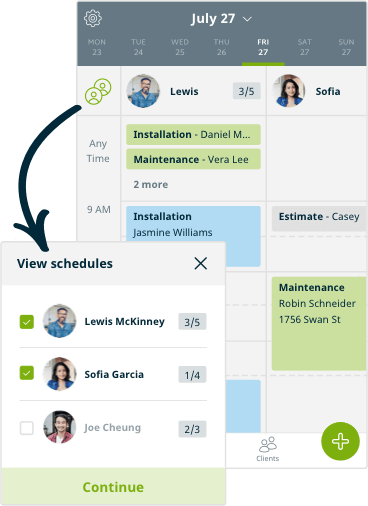 Manage your team permissions, so your crew only sees what you want them to see. 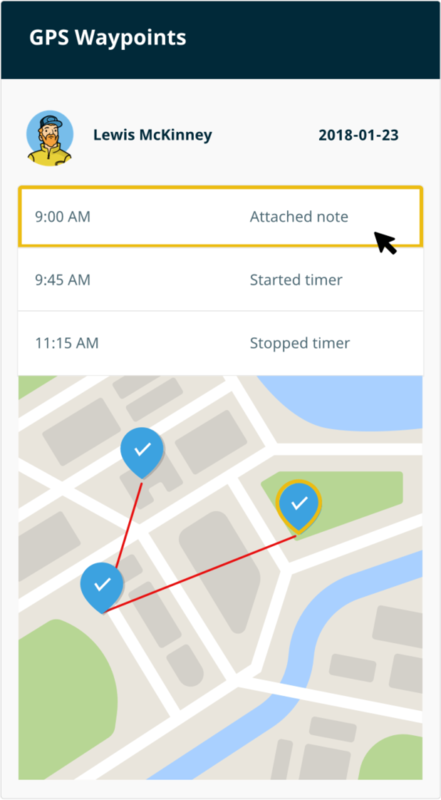 When you clock in and out at a job, edit a job, or create an invoice, Jobber records a GPS waypoint. You can see where your team members are and adjust the rest of the day’s jobs accordingly, and you have another avenue to confirm a job well done with a client. Learn more about GPS tracking. 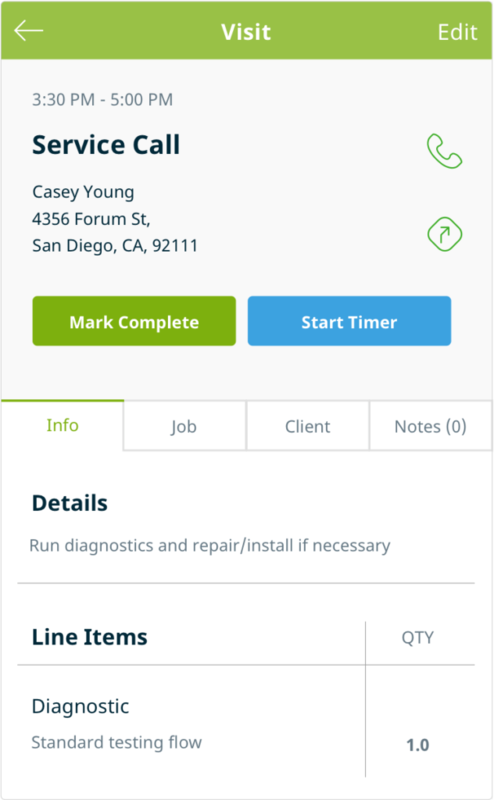 When you mark a job complete, you can create an invoice from the Jobber app. If you’re using Jobber Payments, you can use card scan to accept a credit card payment or record other payment methods such as cash or check. Use the + button in the bottom right corner of the app to access a quick create menu and get a head start on some key actions in Jobber. From this menu, they can create new client profiles, track their expenses, schedule one-off jobs, create work requests, generate quotes, or set up and schedule tasks, such as a reminder to buy supplies or follow-up with a customer.